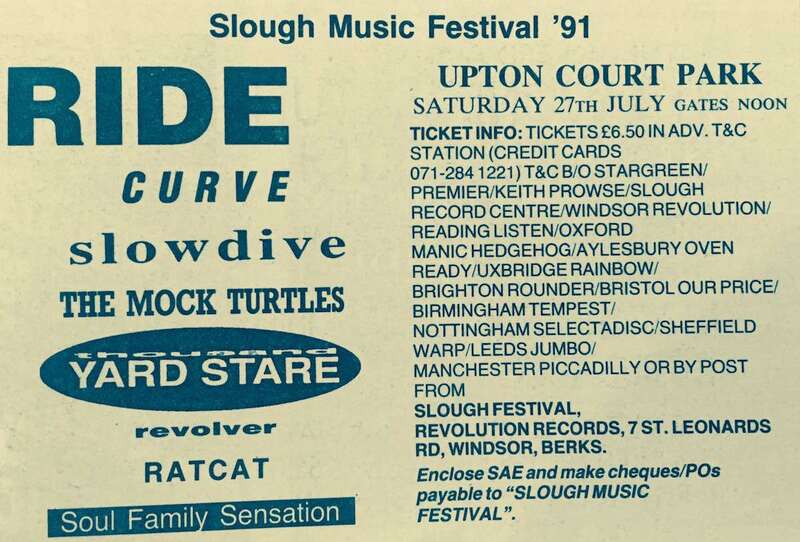 27th July 1991 saw Ride headline their first open-air festival. The Slough Festival was a short lived one day festival that ran for three years between 1990 and 1992 at Upton Court Park. 1990 saw The Soup Dragons, Teenage Fanclub, The Cardiacs, Northside and Frank Sidebottom played a set featuring cover version of Queen, Bros and Kylie Minogue numbers. The following year the festival was massively upgraded and saw 10,000 people desend upon Upton Park. Whilst Ride headlined Slowdive played a late afternoon slot with the likes of Curve, Thousand yard Stare and The Mock Turtles filling the bill. In the 25 years since the event the gig has become quite legendary in certain circles and often described as the “shoegaze woodstock”. On the night Ride previewed various tracks from Going Blank Again including Chrome Waves, Leave Them All Behind and Time of Her Time. The Slough Festival only survived one more year with Jesus Jones, The Fall, Senseless Things and the long forgotten Sensitize taking to the stage…. We’ve uploaded a track from Ride’s set that night, listen to a live extended version of Chelsea Girl below. You can read more about the event over on the Sonic Cathedral website.